Now I know that meat substitutes are not everybody's cup of tea, but for a girl who basically went through her childhood years subsisting on a diet of processed luncheon, sausage rolls, pies and cheerios, and was never really into meat that actually contained any real meat anyway, they are right up my alley. Having lived in Asia for over six years, where mock meat is perfected to sometimes disturbing levels, I like to think of myself as a bit of a connoisseur. And so it not without much research (aka stuffing myself silly with mock meat of all varieties) that I recommend Fry's Vegetarian Products as being rather, dare I say it, awesome. Don't be fooled by the vegetarian label either, their entire range is vegan too (huzzah!) and ticks the boxes on all sorts of things health conscious people are worried about. Not me though, I'm all in it for taste, and they taste good. 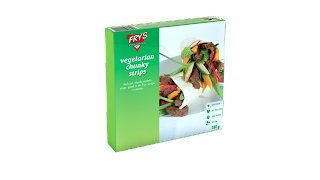 Unlike other 'fake meat' products, that tend to have a habit of tasting just that, Fry's have amazing texture and flavour, especially their Chunky and Chicken Style Strips, and if I can slip 'em into a curry and not have the fiancee notice, then they're definitely onto a winner! With such an extensive range it's hard to pick out favourites, but certainly high on the list are their Original Hot Dogs, which go down a treat lathered in mustard and ketchup, as well as their Chicken Style Burgers, which taste rather like a childhood favourite of mine at the house of Maccy Dees (I know, I know, but it was so hard to resist the happy meal toy...). Now I was going to tell a wee white lie and say that I have sampled all of their products and that they are all amazing, but alas there are still a few I have yet to get my mitts on - namely their Chicken Style Nuggets (even the picture is making me hungry). Never the less I am confident they will deliver like the others and hopefully, for my little taste buds, very soon I can let you know! For ideas on how to use their different meat style strips have a wee peek at my Curry Fried Noodles and Malaysian 'Chicken' Curry recipes. Hey! Great to see another Irish vegan blog :) I'm from Cork btw! I don't eat a lot of meat subsitutes but I tried the Fry's chicken nuggets when I first went veggie and they were so like 'real' chicken they totally freaked me out...which was bizarre as till I went veg I ate a LOT of chicken. Anyway they were very nice! I have tried the sausages at a friend's house and they were great too. Why hello! Another vegan in Cork eh?? The numbers keep growing! I haven't already met you at the Cork Vegan get togethers have I? I've actually just pulled a bunch of cupcakes out of the oven to take over to a potluck this evening. There's usually a meet up every few weeks, you should definitely check it out - they're great craic. More importantly - where did you find the nuggets!!?? Quay Co-op? I can't seem to find them anywhere and am so keen to give em a wee taste test! I know what you mean about things being too real though, I used to be like that with the Linda McCartney sausages, way too accurate for my liking! Oops I should have clarified I live in Dublin now! That's where I got the nuggets.But I'm back in Cork a lot. If you can't get the nuggets at all just let me know and I can bring some to Cork for you. Sorry for the late reply, I've just moved to Galway, without having tried the cake in Gulpd, noooooo! I will have to make a special trip it seems. Will definitely have a look at your blog, vegan sweet treats never fail to excite me! Oh I love Fry's products! I love the schnitzel, sausage, hotdogs, polony, and the pops. Luckily I live in South Africa so I can find their stuff at almost any store. Yummy!